It's full-on here in Hamilton for the annual ULearn conference, with over 1400 registered delegates coming together to share experiences and ideas in what is an excellent example of a knowledge building community. I'm currently sitting in my room before we head out to the conference dinner, putting some thoughs together for the workshop I'm running tomorrow morning. It's titled, 'Schools as networked learning spaces', and in it I want to explore the concept of how we must change our concept of schools as isolated, stand-alone centres of learning, to being nodes on a network of learning, where all involved are a part of an ever expanding knowledge building community. As such, the traditional time/space boundaries that we currently associate with bricks and mortar schools will give way to notions of a more permeable entity that is connected in a broad number of ways to other such entities and the individuals within them. In pondering on this I've made a small alteration to the diagram I've inserted above (which I've used many times previously) – placing emphasis on the concept of a knowledge building community as the defining characteristic of what we might call networked learning. To be frank, this isn't a particularly radical or even future-focused idea – it's happening all around us right now. Both students and teachers are engaged in a myriad of ways in contributing to and drawing from the various contacts they have in their online social networks. It any of them have a question now it is highly likely their first port of call will be an online community they belong to (e.g. Facebook) or a repository of community-built knowledge (e.g. Wikipedia). Some years ago I created a table that contrasts the characteristics of our school system in the previous two eras of (a) centralised control and (b) self management, with what I see emerging in the networked era. It's my attempt to describe what some of the indicators of progress towards this sort of environment might be. 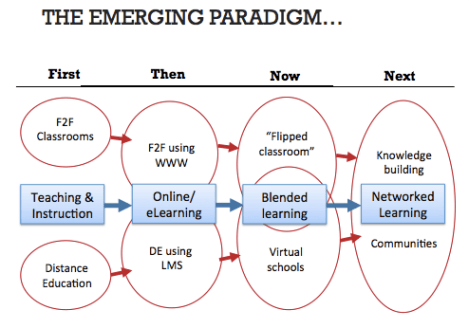 I've done some editing of it since it was first created and will use that also in the workshop tomorrow – attached here..
Schools as networked learning spaces is the future. I'm at the university of Oregon and my focus is education technology. Thanks for writing this, I came across is through some random google searches. Some teachers are providing learning across the net but not enough. As my school moves towards a BYOD system next year, I am still watching teachers work on just their own course that will stay private to their class. As much as I try from my position in the library to model content curation, using scoop.it and Learn.ist, I am one of the few teachers in the school who is creating courses that can be used by a worldwide community of learners. it leaves me wondering what they are scared of?